00:25:00 Makes 8 servings, one stuffing cup (88 g) each. Makes 8 servings, one stuffing cup (88 g) each. 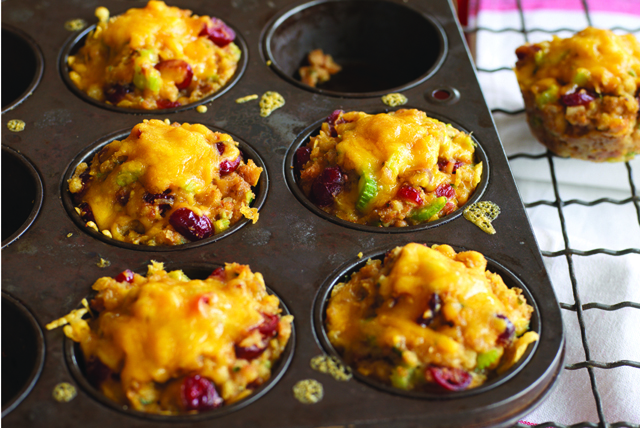 This fun and delectable side dish is everyone's favourite stuffing made into individual muffin-like cups. It's a visually appealing new way to serve a tried-and-true favourite. Perfect for buffets, or any special meal over the holidays. Preheat oven to 350ºF. Heat oil in large skillet on medium heat. Add celery; cook and stir 5 min. or until crisp-tender. Stir in water. Bring to boil. Remove from heat. Stir in stuffing mix, cranberries and walnuts. Add 1/2 cup of the cheese and the egg; mix lightly. Spoon stuffing mixture evenly into eight greased medium muffin cups, mounding mixture as necessary to use all the stuffing mixture. Sprinkle with remaining 1/2 cup cheese. Don't have a muffin pan? Spoon stuffing mixture into eight muffin pan liners instead. Place on baking sheet and bake as directed. Prepare as directed, adding 1 cup sliced fresh mushrooms along with the celery. Serving Size Makes 8 servings, one stuffing cup (88 g) each.